Our previous post pointed to a 1943 Los Angeles Times news article, which mentioned relevant details about field archery and Pasadena’s field range dating back to the earliest years of the sport. An even older Los Angeles Times article from 1891 — just five years after Pasadena’s incorporation as a city — documents how deeply the sport of archery has been ingrained in Pasadena’s history. The article (again, behind a paywall) is available here. The 1891 article comes from the Times’ society pages. It recounts “the social event of the season for the young people” held at the home of Mr. and Mrs. C. D. Daggett on a Tuesday evening in June. Charles Daniel Daggett was a pioneer citizen of Pasadena, a prominent businessman who was active in the social and cultural life of the city, serving as one of the first presidents of the Tournament of Roses and as Grand Marshal of the Rose Parade three times. Among the distinguished guests at this event were Prof. Charles F. Holder and Dr. Francis F. Rowland, the two members of the Valley Hunt Club who founded the Tournament of Roses just one year earlier in 1890. The “young people” at this party included “Master Sobieski Lowe” and “Miss Alice Eaton,” children of even more illustrious Pasadena pioneers, Thaddeus Lowe and Benjamin Eaton. At this summer party 123 years ago, the four Daggett children “entertained their young friends” and “the evening’s pleasure, however, was not confined to the young people, for a number of their friends more advanced in years were fortunate enough to secure invitations, and none more fully entered into the spirit of the affair than they.” The Times article reports that, shortly after the guests arrived at 5 o’clock, “an archery contest was entered upon. Almost everyone present participated, and those who did not, enjoyed the proceedings from the east piazza. Some very creditable scores were made…” and prizes were won by both boys and girls. Archery in 1891 was a sport that could be practiced in the backyards of Pasadena’s landed gentry such as the Daggett family’s estate, but this was decades before the City provided any archery facility for the general public. The Times article does not report any concern for the safety of the archery contest participants or the onlookers from the east piazza or the Daggetts’ neighbors, who were not protected by a 120-foot hillside. Even in 1891, those who engaged in the sport knew that archery was inherently safe. Archery in 1891, as it is today, was a sport enjoyed by boys and girls, men and women. Archery has always been a sport of equal opportunity for all ages and both genders, long before Title IX and other legislation mandated such equal opportunities in other sports. Even though archery was inherently enjoyable by all, it took an enlightened Pasadena city government to open the sport to the general public. 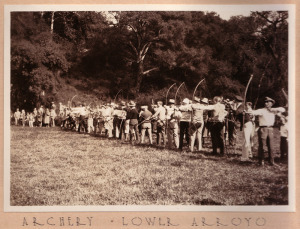 The City permitted archery to take root in the Lower Arroyo in the 1920s and 1930s, first at the Target Archery Range and later at the Field Archery Range, always insisting that these ranges be open and available to the public at large. Due to continued support by Pasadena’s city leaders, all members of the public have been able to practice archery in the Lower Arroyo Park for nearly a century. Pasadena has remained committed to the principle that archery should be accessible to all, not only the landed gentry and their guests, and not only the private archery clubs who established and maintained the Lower Arroyo ranges. In today’s debate, a small segment of the landed gentry is resurgent, seeking to roll back nearly a century of progressive city policy by drastically restricting or eliminating the general public’s opportunities to practice archery at the Lower Arroyo range. Ironically, one of their proposals is to restrict archery in the Lower Arroyo to events conducted by a private club, the Pasadena Roving Archers (PRA), a group whose aims they otherwise oppose. Pasadena’s present-day leaders should resist this pressure from powerful interests. The City Council should not roll back a century of progressive city policy toward archers and their sport. The Lower Arroyo Field Archery Range should be kept open to the public for archery seven days a week. An old newspaper article – written in 1943 – provides some useful background for the current debate about the Lower Arroyo Archery Range. The article was published in the Los Angeles Times and is available (alas, behind a paywall) here. The Pasadena field range already had 28 targets in 1942. Not only does the Times article mention the number of targets twice, it also reports meticulously the total number of arrows and the maximum possible score for the championship rounds: “Two rounds are fired and four arrows used on each of the 28 targets (a total of 224 shots if your arithmetic isn’t so good.) Best possible score is 1120 …” Unlike documents which only mention the number of targets in passing, these extra numerical details in the 1943 Times article reinforce its reports of 28 targets and rule out any possibility that these reports might have been typographical errors. The earliest NFAA outdoor championships were conducted by mail, with competing archers shooting the same standardized rounds at their own local courses. The Outdoor NFAA Mail Tournament competition started in 1941, and the NFAA Standardized Field Round was adopted in 1942. NFAA’s crowning of Ken Moore as its 1942 national champion implies that the NFAA recognized Pasadena’s field range as a championship-caliber course in 1942. Ken Moore lived and worked in Northeast Los Angeles, about 1/2 mile outside Pasadena’s western border. Nonetheless, the City of Pasadena in 1942 welcomed this non-resident to practice his craft and to win his championship on Pasadena’s range, which has always been a regional asset. In return, the City could bask in the glory of being the site of the national champion’s exploits — much like the whole country tuned in earlier this month to watch non-resident football teams from Oregon and Florida State compete in the national semi-finals at the Rose Bowl, another regional asset that distinguishes Pasadena as a Great City. In the 1943 Times article, Ken Moore makes the golfing analogy, saying that field archery is “similar to golf, in that it’s played (or shot) over a course with 28 targets laid out similarly to an 18-hole links. There are high and low targets, ones that require kneeling stances, ‘dog legs,’ narrow corridors of trees or shrubs, and numerous other hazards to make the shooting tough.” Remember, this is a national champion 72 years ago trying to be informative about his sport, not an advocate trying to sway the vote of a City Council in 2015. The analogy between field archery and golf is intrinsic, and dates back to the beginnings of the sport. “Contact an archery club for advice on what equipment to buy … even a champ can’t fire warped arrows straight.” It’s too bad Mr. Moore can’t be here today to tell the Council about the improbability of warped arrows soaring to backyards atop a 120-foot hillside. “Get a good archer to show you the technique.” The Pasadena Roving Archers (PRA) have been conducting weekly classes for the general public since the 1960s. “After that, practice is the prime factor.” In fact, Mr. Moore “used to practice daily” while “perfecting the technique.” In the current debate before the Council, PRA and other archers stress that the range should be kept open throughout the week because archers need daily practice to get good. We hope that members of the City Council will take a moment to read old-time news articles like this one to gain some insights into the true history of archery in Pasadena. Such contemporaneously published accounts don’t suffer from the retrospective biases of advocates on either side in the current debate. 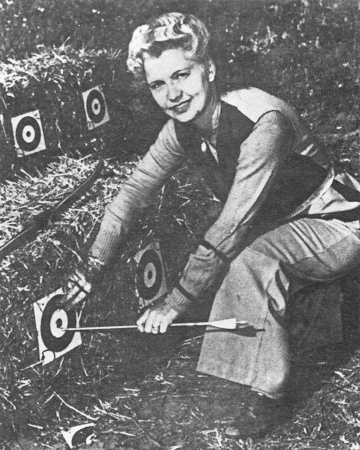 Matilda “Babe” Bitzenberger, co-founder of the Pasadena Roving Archers. Pasadena’s Lower Arroyo used to be home to three archery ranges for three different archery sports (target, field, 3D). While all three archery ranges have been a part of Pasadena’s historic commitment to supporting archery sports, the Public Field Archery Range is the Crown City’s crown jewel in this respect. The erstwhile Target Archery Range, though seven years older than the field range, had roughly the same historic significance as the Brookside Golf Courses: both were old and venerable within Southern California, but not very old relative to their respective sports which had been practiced for centuries in other places throughout the world. The field range, on the other hand, dates back to the very beginnings of the sport of field archery. This sport was invented in Redlands in 1934, and was quickly adopted in Pasadena in 1935 under the leadership of legendary local archers Henry and Matilda (Babe) Bitzenburger. 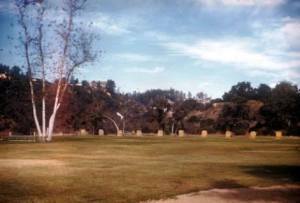 Pasadena’s Field Archery Range is the oldest surviving range from the early years when this sport was birthed. Pasadena’s Field Archery Range has roughly the same historic significance to the sport of field archery as Scotland’s St. Andrews Old Course has to the sport of golf. Golf wasn’t invented at St. Andrews, but it was the first place where an 18-hole golf course was adopted, and the consensus among golf enthusiasts all over the world is that St. Andrews is the historic home of golf. As the world’s oldest surviving field archery range dating back almost to the sport’s inception, Pasadena’s range in the Lower Arroyo has a better claim to being the historic home of field archery than any other place on earth. Relocating the Field Archery Range or removing some of its 28 targets would be akin to the Town of St. Andrews relocating the Old Course or eliminating some of its 18 holes. Fortunately, the UK is so protective of its historic golf legacy that Parliament has passed a law ensuring that such a desecration to the history of golf will never happen. Pasadena’s city leaders should similarly take enormous pride in preserving the City’s historic recreational sports treasures. They’re an important part of Pasadena’s unique character, and they contribute significantly to making Pasadena a Great City. Pasadena is well known as home of the world famous Rose Bowl – the “granddaddy of them all” among college football bowl games and stadiums. But Pasadena was also a groundbreaking pioneer in adopting and preserving two lesser known sports: disc golf in the Upper Arroyo and field archery in the Lower Arroyo. How amazing that one city could have created and maintained three “granddaddy of them all” sports facilities, all within a few miles of each other and all within the same Arroyo Seco. Current-day city leaders should preserve Pasadena’s historic recreational treasures in the Arroyo and not overrule the judgment of nearly a century of preceding city leaders by starting to dismantle the historic sports facilities that they enabled and supported through all these years. Keep Pasadena a Great City by respecting and preserving its historic recreational sports legacy. Pasadena’s legacy of archery in the Lower Arroyo is the history of three different archery sports and three separate archery ranges supported and maintained by three different archery clubs. First there was Pasadena’s Target Archery Range, established in 1928 on the east side of the channel by the Pasadena Target Archers (PTA) for the long-established sport of target archery. Then came Pasadena’s Field Archery Range, established in 1935 on the west side of the channel by the Pasadena Roving Archers (PRA) for the newly invented sport of field archery. Finally, there was the Sagittarius 3D Archery Range, established around 1950 by the Sagittarius Club and extending northward from the Field Archery Range. While these three archery ranges were historically referred to as the PTA range, the PRA range, and the Sagittarius range, they have always been City-owned recreational facilities open to the public at large. These ranges were not private enclaves of the archery clubs who maintained them. Rather, they have represented Pasadena’s historic commitment to providing facilities for the public to enjoy these types of recreation. For a period of nearly three decades from 1950 until the closing of the PTA range in the late 1970s, these three ranges made Pasadena’s Lower Arroyo a mecca for archery sports unrivaled anywhere in the world. The Pasadena Target Archers range occupied the east side of the Lower Arroyo north of California Street from 1928 to 1975. The AIDS Memorial Grove was planted on the area beginning in 1991. Since the late 1970s, the history of archery in the Lower Arroyo has been one of consolidation, not expansion. First the PTA range was closed and its memberships were transferred to PRA. Approximately ten years later, the Sagittarius club also folded, and PRA absorbed many of its members and activities. Even though the Sagittarius range (northern range) was not closed at that time, as of the 2003 adoption of the Lower Arroyo Master Plan (LAMP), archery has only been permitted on the Sagittarius range for PRA events on a maximum of 13 Sundays per year. Today, all three archery sports take place regularly within the historic Field Archery Range (southern range). Archery activities that once spread over more than 20 acres on both sides of the channel have now been consolidated into a little less than 10 acres within the confines of the Field Archery Range (not counting the minor extension into the old Sagittarius range for 13 specific PRA events per year). This consolidation has been possible because a field archery range can host not only field events, but also some types of target and 3D events as well as general archery instruction and practice areas. However, the reverse is not true. The sport of field archery cannot be accommodated on a target archery range, nor on the old Sagittarius range. A field archery range bears roughly the same relationship to a target archery range as a full-size golf course bears to a driving range. Squeezing all three archery sports into less than 10 acres has only been possible because the unique topography of the Lower Arroyo is conducive to a much more compact field course design than the 15 to 30 acres normally recommended by the National Field Archery Association (NFAA). The PRA clubhouse stood on the west side of the Lower Arroyo from 1945 to 2002, when it was destroyed by arson. This photo was taken in the 1970s. The fundamental feature that distinguishes a field archery range from a target archery range is that field archery is contested over a 28-target course presenting archers with varying distances and terrain conditions, just like an 18-hole golf course presents a set of varying challenges to golfers. Field archers were shooting at 28 targets at the Lower Arroyo range even before the 28-target course was standardized by NFAA in 1942. The Pasadena range has always had 28 targets except for one decade from 1963 to 1974 when PRA could only maintain 14 targets due to declining membership and resources, though the bales and shooting lines of the lower 14 were never removed. The exact details of the earliest 28-target courses are not well documented. However, ever since PRA resumed use of the full 28-target course in 1974, the Field Archery Range has remained in the same configuration for the past 40 years. This is documented by City records and PRA records, as well as historical aerial photos dating back to the 1970s.